High Definition Art Work print on canvas with vivid color on thick high quality canvas to create the look and feel of the original nature and masterpiece. The side margins are also printed to create a particularly decorative effect. Oufeiyan is one of the largest online suppliers for modern canvas wall art, including 100% hand-painted oil paintings on canvas, photo to portrait painting, photo to canvas print, canvas prints. Whether you are looking for a Van Gogh paintings reproduction, abstract paintings, landscape paintings, or high definition picture print on canvas, you will find it at Oufeiyan. For your convenience, please search "Oufeiyan + your product" to take the fastest way to buy other products you want and have a clear view of other products we offer in store. Stretched and framed Black White Morden City Picture canvas paintings wall art ready to hang for home decorations wall decor. Each panel has a black hook already mounted on the wooden bar for easy hanging. 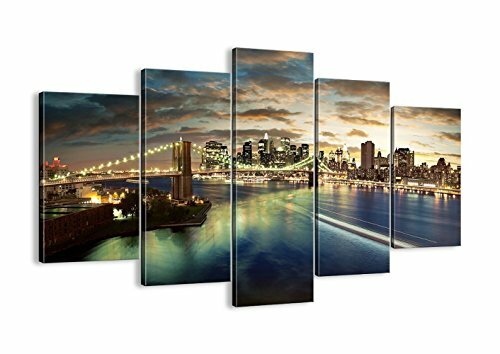 High Definition Giclee Broooklyn Bridge and New York modern canvas printing artwork, picture photo printed on high quality canvas. A perfect Christmas and New Year gifts for your relatives and friends. A perfect wall decorations paintings for living room, bedroom, kitchen, office, Hotel, dining room, office, bathroom, bar etc.Suitable fot All Saints Day Halloween Image.